134395328 –For one-semester Anatomy & Physiology courses. Thoroughly updated with dozens of new figures, photos, and current information on medical recommendations and terminology, the 12th Edition continues to set the standard for brief, accessible one-semester A&P texts. The authors’ hallmark clear and friendly writing style has been strengthened with familiar analogies and abundant mnemonic cues that help in learning and remembering concepts. 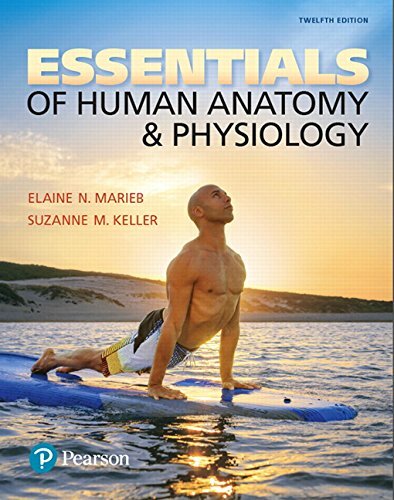 Continuing to offer just the right balance of anatomy, physiology, and clinical coverage, engaging new chapter previews help learners hone in on what structures and functions they are studying, how they function, and why they are important to learn. New vocabulary-building activities, a mobile-friendly eText, and Interactive Physiology 2.0 tutorials expand the options for using Mastering ™ A&P as an effective practice and learning tool. Mastering™A&P is an online homework, tutorial, and assessment program designed to engage students and improve results. Instructors ensure that students arrive ready to learn by assigning educationally effective content before class, and encourage critical thinking and retention with in-class resources such as Learning Catalytics™. Students can further master concepts after class through assignments that provide hints and answer-specific feedback. With a wide range of activities available, students can actively learn, understand, and retain even the most difficult concepts. Note: You are purchasing a standalone product;Mastering™A&Pdoes not come packaged with this content. Students, if interested in purchasing this title withMasteringA&P, ask your instructor for the correct package ISBN and Course ID. Instructors, contact your Pearson representative for more information.